When we recite the Apostles’ Creed, it’s all too easy to rattle off each clause without devoting our full attention to the words. “Suffered under Pontius Pilate; was crucified, dead, and buried; he descended into hell…” The Heidelberg Catechism, however, reminds us that the Creed is a careful and thorough summary of the tenets of Christianity by carefully and thoroughly examining its contents. Today in our URC Psalmody series on the Heidelberg Catechism we turn to Lord’s Day 15.
that was to fall on us. since death by crucifixion was accursed by God. “During his whole life on earth, but especially at the end…” It can be easy to forget that Jesus’ suffering did not begin in the Garden of Gethsemane; his entire life on earth, from his lowly birth in a stable to the moment he cried, “It is finished,” was a life of affliction and pain, both physical and spiritual. As Psalm 69 says, it was Christ’s zeal for his Father’s house and its worshippers that caused this suffering. “Christ sustained in body and soul the anger of God against the sin of the whole human race.” Psalm 77 gives us just a glimpse of the wrath of God which Christ endured for our sakes. “This he did in order that, by his suffering as the only atoning sacrifice, he might set us free, body and soul, from eternal condemnation, and gain for us God’s grace, righteousness, and eternal life.” Psalm 22 sets forth for us the agony of Christ on the cross, but it does not stop there; it also goes on to show the glories of salvation. “This death convinces me that he shouldered the curse which lay on me, since death by crucifixion was accursed by God.” The previous three psalms reflect Christ’s experience, but what of ours? What was the penalty we deserved, and how was it paid? This section of Psalm 107 beautifully illustrates our plight and the deliverance wrought by God. With these words in mind, we ought to find ourselves paying more attention next time we recite the part of the Apostles’ Creed that says Christ “suffered under Pontius Pilate; was crucified, dead, and buried; he descended into hell.” This confession should motivate us to turn in disgust from our sins and cling rejoicing to our Lord and Savior Jesus Christ, who suffered and died that we might live. Believers and unbelievers alike are certainly familiar with the name “Jesus Christ.” Indeed, our culture is saturated with references both reverent and profane to this appellation. But do the words “Jesus” and “Christ” carry any deeper meaning of which Christians should be aware? In Lord’s Days 11 and 12, the Heidelberg Catechism helpfully expounds the Scriptural truths behind these two names of God’s Son, while drawing out key points of application for the believer. Today, as we return to our ongoing series connecting the Catechism with the Psalter Hymnal, we turn to the two questions and answers of Lord’s Day 11. 29 Q. Why is the Son of God called “Jesus” meaning “Savior”? A. Because he saves us from our sins. it is futile to look for any salvation elsewhere. 30 Q. Do those who look for their salvation and security in saints, in themselves, or elsewhere really believe in the only Savior Jesus? the only savior and deliverer, Jesus. have in him all they need for their salvation. 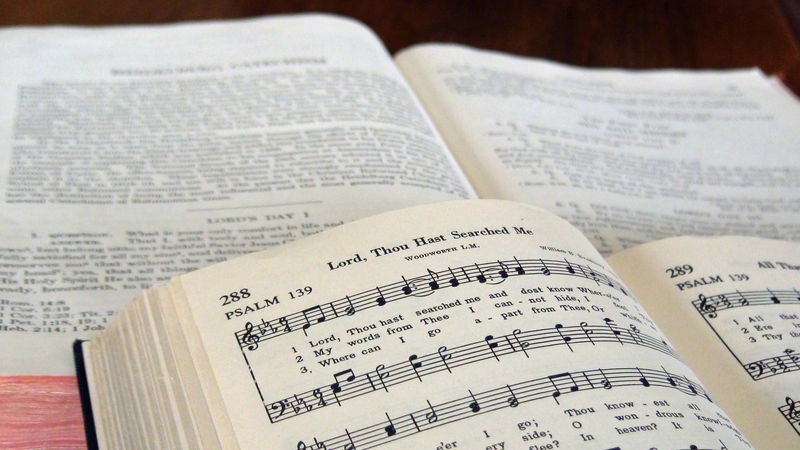 Since the number of hymns that focus on Jesus as Savior is overwhelming, it’s a relief to be able to limit this discussion to the psalm settings in the blue Psalter Hymnal. In particular, I found four songs based on Psalms 98, 62, 95, and 115, all of which powerfully confirm the theses of this Lord’s Day. “Salvation cannot be found in anyone else; it is futile to look for any salvation elsewhere.” While Psalm 62 primarily focuses on God’s help in opposition to a crafty foe, much of its text displays the exclusive confidence known only to the believer. The heavens, and earth’s foundations laid. But we will sound His praise abroad. What comfort is ours as we realize that our savior Jesus Christ has fully paid for all our sins with His precious blood! How good it is to be His own!